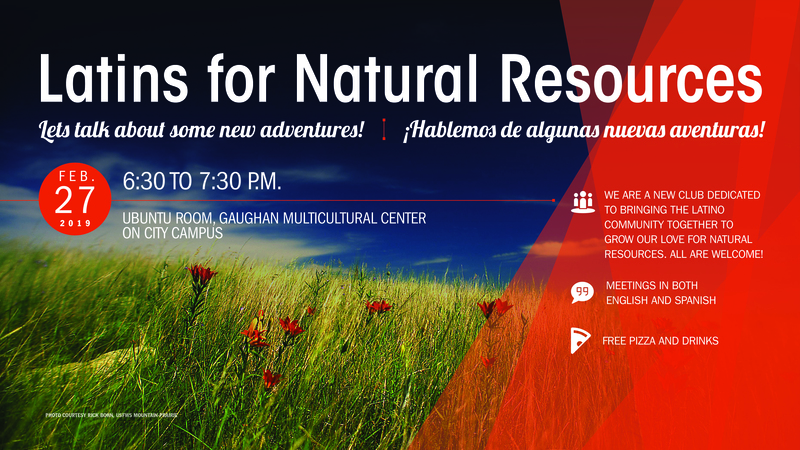 Latins for Natural Resources will host their first meeting Feb. 27 in the Jackie Gaughan Multicultural Center, 1505 S Street, Lincoln. Latins for Natural Resources will host its first meeting from 6:30 to 7:30 p.m. Feb. 27 in the Ubuntu Room of the Jackie Gaughan Multicultural Center, 1505 S Street, Lincoln. The club is dedicated to bringing together the Latino American community on both Nebraska campuses to expand the community of nature lovers, and meetings will be conducted in both Spanish and English. The group also will provide a safe, welcoming, all-inclusive space for students, no matter their heritage or gender. The group will provide opportunities to connect with and learn more about natural resources, which includes everything from groundwater to reptiles to wind, and to participate in outdoors activities. Free pizza and Pepsi will be offered at the inaugural meeting. Those interested in participating can join the Latins for Natural Resources listserv here. You also can find them on Facebook, Twitter and Instagram, or keep up-to-date at their website. For more information about University of Nebraska-Lincoln student organizations, click here.